Motorcycles « Global Market Insights, Inc.
Electrical steering column lock market has been witnessing a profitable growth rate since the last few years, pertaining to the growing popularity of the electric power steering (EPS). The EPS technology is lately being preferred in automobiles for its ease of use and the fuel efficiency. 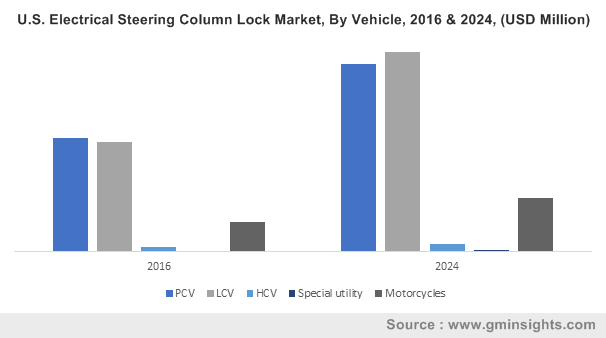 Also, there has been a paradigm shift in the deployment of automotive components from mechanical to electronic solutions, which has led to electrical steering column lock (ESCL) market carving out a positive growth trajectory. 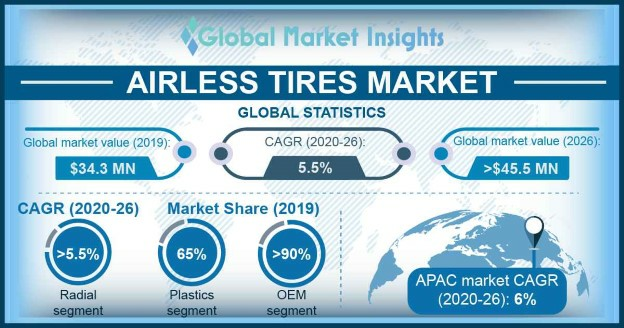 By 2024 ESCL market size is predicted to surpass a valuation of USD 31 billion, driven by innovations in the automotive sector and the existence of a favorable regulatory landscape that mandates the adoption of EPS in new automobiles. As electrical steering column locks make vehicles much more resistant to thefts, there has been an increase in consumer demand for purchasing cars embedded with these products, thereby augmenting ESCL industry share. With the emergence of new economies and the rising affordability of vehicles, global automobile manufacturing and sales are expected to soar higher in the years to come. This in consequence, would lead to a robust rise in the sales of automobile integrated with security features, which in turn would impel ESCL market. With security being one of the consumers’ principal concerns, cars incorporated with anti-theft features will make them highly viable choice, which will boost the overall electrical steering column lock market size. A shift of conveyance preference has also been noted with the rise of connectivity and online shopping alternatives. Many consumers nowadays prefer to have goods and services delivered at home – a trend that has provided an impetus to the commercial vehicle industry. In order to make these vehicles more fuel-efficient, the deployment of electric power steering has been made mandatory, which inevitably indicates the implementation of electrical steering column locks in these vehicles to ensure security. In consequence, the commercial vehicle sector would prove to be a lucrative avenue for ESCL market. As per estimates, LCV-based ESCL industry size alone is expected to register a CAGR of 6% over 2017-2024. Significant growth will also be registered in the special utility vehicle segment as customers are leaning towards tailored solutions for specific purposes. Electrical steering column lock market share, as per statistics, is estimated to record a 4.5% CAGR over the next seven years from the special utility vehicle sector. Original equipment manufacturers (OEMs) and traditional automotive players, in recent times, are under continuous pressure to bring about advanced technologies in vehicles that will improve fuel efficiency, reduce emissions and be more capital-efficient. OEMs stand to gain the most advantage with the growth of electrical steering column lock industry, as customers prefer relying on OEMs for their process expertise and reliability. On the other hand, aging vehicles will impact electrical steering column lock market size from the aftermarket domain, as these vehicles are the ones that did not have an installed lock at the time of manufacture, but would now be forced to have one installed or security purposes. Due to the robust progress of the automotive sector in countries such as China, India and Indonesia, APAC electrical steering column lock market is expected to witness a substantial growth rate over 2017-2024. China alone, in 2016, accounted for 48% of the global SUV shares. In fact, estimates claim Asia Pacific to dominate the overall electrical steering column lock industry by 2024, with a revenue projection of USD 13 billion. Government directives for better vehicle security has been the driving force for the growth of North America electrical steering column lock market. The National Highway Traffic Safety Administration (NHTSA), for instance, a traffic regulatory body of U.S. has mandated the use of electrical steering column locks in all vehicles. Uniform provision for performance and layout of all vehicle systems as authorized by the European directives will also ensure the implementation of these security products in all vehicles, giving Europe electrical steering column lock market a commendable boost over 2017-2024. One of the key threats that electrical steering column lock industry will face in the ensuing years is the introduction of fully autonomous vehicles which come essentially without a steering wheel, a fact that will make the electrical steering column locks redundant. However, security risks, lack of consumer understanding and slow rate of market penetration of autonomous vehicles will not make them commercially viable before 2030, which would prove to be an advantage for ESCL industry. For now, OEMs and other major ESCL market players are focusing on making the electrical steering column lock systems in vehicles much better, ensuring not only security but also attracting a wider customer base with better and innovative safety technologies. This entry was posted in Automotive & Transportation and tagged Aftermarket, Distribution Channel, Electrical Steering Column Lock Market, Electrical Steering Column Lock Market Research, Electrical Steering Column Lock Market Segmentation, Electrical Steering Column Lock Market Share, Electrical Steering Column Lock Market Size, HCV, LCV, Motorcycles, OEM, PCV, Special Utility, Vehicle. 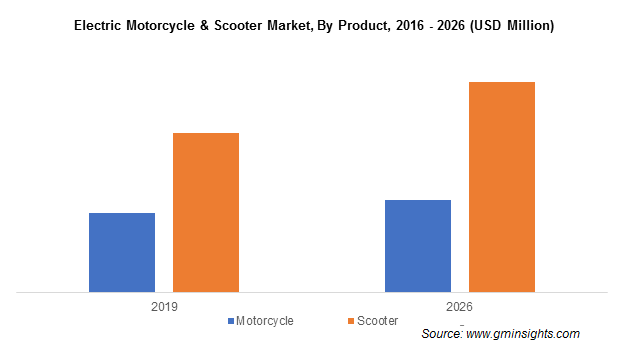 Powered by depleting fossil fuel resources & rising increasing concerns on CO2 emissions, electric motorcycles & scooters market has witnessed quite an exponential growth graph lately. Renowned superbike manufacturers like Benelli, Honda, and many more have been involved in myriad research and development activities to launch innovative and effective e-motorcycles. Validating the aforementioned fact, in 2017, Honda launched its future electric and hybrid technology at the Tokyo Motor Show. The technology can apparently be used for the deployment of cleaner, emission-free scooters, as it is endowed with easy battery swapping, enabling users to change batteries any time and get back on the road. Honda’s initiative is remnant of incredible efforts undertaken by prominent electric motorcycles and scooters market giants to contribute toward a greener future. Taking into account the environmental benefits of using electric vehicles, many regional governments have also been implementing strict regulatory norms that would prompt a surge in the adoption of e-vehicles. In accordance, vehicle manufacturers have been found to consistently implement new technologies for attracting end-users. Speaking along the same lines, the governments of several countries have been striving to reduce the ever-lasting, hazardous issue of air pollution. In order to reduce the sale of fuel-powered vehicles for an emission-free future, government bodies have been providing subsidies and incentives to electric motorcycles and scooters industry firms. This alone has proved to be a commendably attractive force for renowned car manufacturers to penetrate the expanding electric motorcycles and scooters industry. The leading two-wheeler manufacturer, Harley Davidson recently made it to the headlines for announcing its intention to launch its fully electric motorcycle, mainly designed for the reckless youth populace. Harley Davidson’s initiative may encourage numerous other companies to introduce fully electric motorcycles that would transform urban transportation. Aided by the increasing popularity of these vehicles by the day and their subsequent deployment, electric motorcycles and scooters industry trends will witness a dynamic transformation in the years to come. As startups have now begun to penetrate electric motorcycles and scooters industry, the vertical seems to be on the verge of witnessing a ferocious competition. For instance, in the U.S., many skateboard manufacturers have been investing in development of electric scooters. Popular skateboard manufacturing companies such as Bird, Spin, and LimeBike have deployed dockless electric scooters on West Coast and other bigger cities across U.S. In order to generate substantial remuneration, these scooter manufacturers are increasingly investing in research and development activities. With the launch of advanced versions of e-vehicles, U.S. electric motorcycles and scooters industry is slated to register a CAGR of more than 16.4% over 2018-2024. The shifting trend toward green and emission-free resources will generate lucrative opportunities for potential new investors in electric motorcycles & scooters industry. The launch of innovative and advanced vehicles will help new entrants suitably augment their product portfolios over the years ahead. Regional governments have also been standardizing a set of regulatory norms that are expected to help vehicle manufacturers attract more customers. Lately, reducing vehicle cost has also emerged as one of the strategies adopted by the already established manufacturers in electric motorcycles and scooters market, to further strengthen their consumer pool. Driven by a slew of sustainability goals charted out by regulatory agencies with regards to energy efficiency, electric motorcycles and scooters industry size is anticipated to be pegged at USD 22 billion by 2024. This entry was posted in Automotive & Transportation and tagged Battery, Electric Motorcycles & Scooters Market, Electric Motorcycles & Scooters Market Analysis, Electric Motorcycles & Scooters Market Research, Electric Motorcycles & Scooters Market Share, Electric Motorcycles & Scooters Market Size, Electric Motorcycles & Scooters Market Statistics, Li-ion, Motorcycles, NiMH, Scooters, SLA, Voltage.